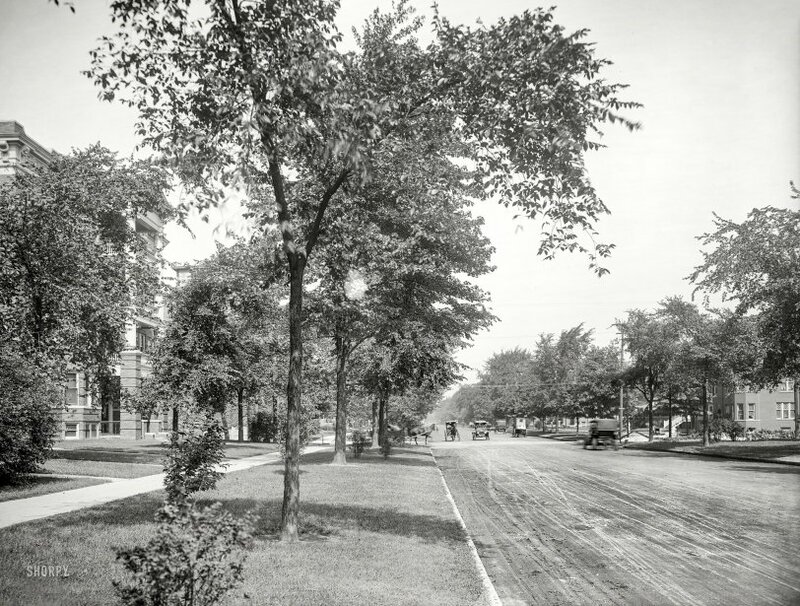 Detroit, Michigan, circa 1910. "East Grand Boulevard." 8x10 inch dry plate glass negative, Detroit Publishing Company. View full size. Submitted by archfan on Sat, 04/28/2018 - 12:49am. rayray asks where is everybody in Detroit? Detroit's peak population was 1.8M in 1950. Starting in the 50s, people began moving out to the suburbs. Now, the population is around 700K. That means Detroit needs just over a third of the homes it had in 1950, so you get vacant lots and abandoned buildings. There are the same number of city streets, but just over a third of the folks to populate them. There are interesting things happening in Detroit now. We'll see if it's enough to reverse a 60+ year trend of declining population. Submitted by PhotoFan on Fri, 04/27/2018 - 12:51pm. Much of Detroit has been depopulated over the last 50 years. Entire neighborhoods can have just one or two occupied houses per block. The city wants to consolidate the remaining residents in fewer neighborhoods and return the vacant areas to their natural state to save money on city services such as public transport and street lighting. Submitted by rayray on Thu, 04/26/2018 - 6:31pm. Comparing the last couple of Shorpy pics of Detroit versus recent Google street view, I can't help but notice that there almost seems to be more activity (people, vehicles) in the old pics versus recent Google street views. I just traveled down East Grand Boulevard on Google and couldn't help but notice an amazing number of vacant lots and empty streets for a city the size of Detroit. Where is everybody? Submitted by DrDetroit on Thu, 04/26/2018 - 3:48pm. The Packard Motor Car Co. relocated from Warren, OH to 1580 East Grand Boulevard in 1903 - cannot be that far away. Here it is 7 years later in 1910 and the car to horse ratio is about even. And it appears that a model T and not a Packard is heading our way.